Noreen Renier is not your run-of-the-mill psychic detective. Renier considers herself a born skeptic. But the sudden onset of her psychic abilities changed not only her beliefs but the course of her life and career. As she followed her new path to see where it might lead, she found herself with a remarkable career spanning more than two decades and still going strong. Her work helping distraught clients and police with dead-end cases has been the subject of numerous media stories, and her cases have been featured in television documentaries and true crime books. 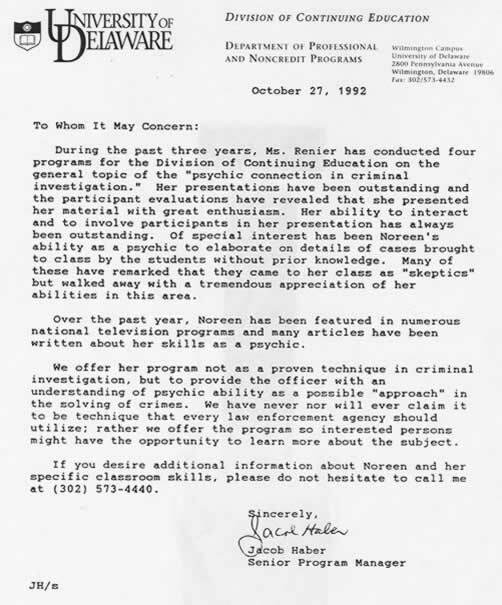 Her integrity has been backed repeatedly by FBI and police officials, and Court TV online recently called her "the most credible psychic out there." Noreen Renier's engaging lecture and engrossing personal account of how she began her work on some of the many murder and missing persons cases she has been asked to investigate. This fascinating first-person true crime lecture brings the audience directly into Noreen's world---in which reliving emotionally shattering and physically violent experiences is part of the job---and underscores the humor and courage of this truly original woman. This police psychic will intrigue and entertain you. For booking or inquiries, please contact Ms. Renier via the contact page.